I slept in, for the first time since I arrived at camp. Until 5:45! I feel very rested but as a result have too little time to write a long post. Weed whacking awaits. If it's any consolation, I dreamed a wonderful post last night as I slept in my little bunk. If only I could remember it. I've received a number of requests both to describe the camp itself and to write more about my fellow prisoners. Because it's easier to do in the few minutes I have before the bus leaves for Vandenberg, I'll start with a description of the camp. I hope that you may find it useful should you ever decide to (hopefully voluntarily) visit. 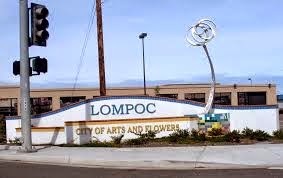 Lompoc, to put it politely, is a bumfu$@ town (as we used to say growing up in Wisconsin about the neighboring bumfu$@ town down the road) located more or less in the middle of nowhere. 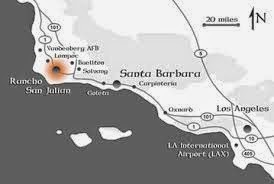 To be more precise, it's located about 2 1/2 hours north of Los Angeles, well beyond that city's endless urban sprawl. Beyond the furthest reaches of civilization, in other words. Unlike its more famous brethren along the mid-California coast (think Santa Barbara, San Luis Obispo, Santa Cruz), Lompoc is nothing to write home about. Not only is it a two stoplight town (with no public restrooms as we learned on our first day here), but it is not even on the coast. The ocean is somewhere across the fields. Lest I paint too dismal a picture (I don't want to discourage anyone from visiting me after all), we are part of the coastal climate, meaning cool mornings, occasional fog, drizzle, the smell of the sea. The occasional wayward seagull stops by as well. Should you find your way to Lompoc and decide to stop by the camp you make your way down the main street, past the two stoplights, a 7-Eleven and some abandoned buildings, until you come to a small road, aptly named Farm Road, surrounded (you guessed it!) by farms. There you turn right and continue along for a mile or two until you happen upon a sea of barbed wire and watchtowers to your left. Although a hill conveniently blocks the view of the prison from the town itself, don't worry. You won't miss it. 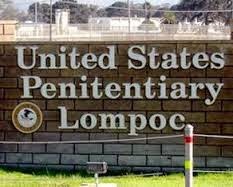 In case you do, the big signs that reads "UNITED STATES PENITENTIARY LOMPOC" should be enough to get you back on track. It was this vista that greeted - and shocked - my mom and I the day I came to self surrender. Let's just say that the site does not exactly create a warm and fuzzy feeling in the pit of your stomach. Luckily enough for yours truly, these worst, most stereotypically prison-ish (is that a word?) buildings that greet you on your arrival are not, in fact, part of the camp. They comprise the other two complexes at the complex - confused yet? : the Medium Security Pen (designed and built to replace Alcatraz) and an adjacent low security prison for the model prisoners from the medium security prison. Everyone who's spent any time in these enlightened places of confinement says the same thing: if you don't absolutely have to go, don't. Having checked into the Medium Security Prison on my first day, I can say that I wholeheartedly agree. First-time visitors often end up at one of these other places and are shocked and appalled that their loved ones could be there. My home, the camp, is tucked back behind those other two buildings, barely visible from the road. From the outside looking in it doesn't appear anything special (actually, the reverse holds true as well): a large plot of land covered with grass and cyprus trees, a bunch of squat, low buildings painted green. What it looks like to me from a distance, given my background, is a typical Midwestern farm minus the farmhouse itself: a bunch of low outbuildings and fields. Upon entering, what you see first is the camp administration building, the nicest building on the lot, surrounded by green grass and flowers. This is the home of our fearless leaders and, befittingly, we prisoners mostly keep away. To enter, if we dare, we must knock quietly on the door and linger at a bus stop across the way until we are noticed. Next to that is the chapel building, one of my favorite places, not because I'm a god-fearing man but because it's a nice quiet place with rooms to write and contemplate life. Most importantly, it has the only non-barracks bathroom, a quiet normal one-person space where you aren't surrounded by 20 prisoners doing their business. Well, it turns out that I had more to say about the prosaic surroundings than expected. Time to go earn my 5 cents/hour. I'll return to this topic in the next post next week. Have a great weekend out there in freedom-land.